Plants cespitose, often glaucous, not rhizomatous. Culms 8-65(77) cm, erect or geniculate to slightly decumbent, sometimes puberulent; nodes 4-6, mostly concealed, usually glabrous, sometimes pubescent. 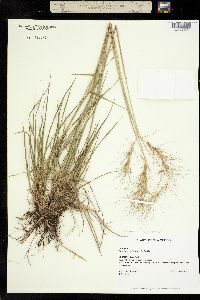 Leaves evenly distributed; sheaths glabrous, scabrous, puberulent, or densely white-villous; auricles usually present, to about 1 mm, often purplish; ligules shorter than 1 mm, truncate, entire or lacerate; blades (1)2-4(6) mm wide, spreading or ascending, often involute, sometimes folded, abaxial surfaces glabrous to puberulent, adaxial surfaces scabrous, puberulent, hirsute, or white-villous. Spikes 3-20 cm long, 5-15 cm wide, erect to subflexuous, with 2-3 spikelets per node, rarely with 1 at some nodes; internodes 3-10(15) mm long, 0.1-0.4 mm thick at the thinnest sections, usually glabrous, sometimes puberulent beneath the spikelets. Spikelets 10-20 mm, divergent, sometimes glaucous, at least 1 spikelet at a node with 2-4(5) florets, 1-4(5) florets fertile, sometimes all florets sterile in the lateral spikelets; disarticulation initially at the rachis nodes, subsequently beneath each floret. 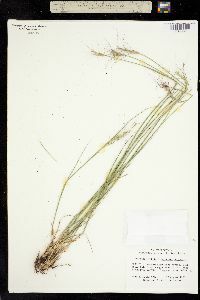 Glumes subequal, 20-135 mm including the often undifferentiated awns, the bases indurate and glabrous, glume bodies 5-10 mm long, 1-3 mm wide, linear to setaceous, 1-3-veined, margins firm, awns 15-125 mm, scabrous, sometimes split into 2-3 unequal divisions, flexuous to outcurving from near the base at maturity; fertile lemmas 6-12 mm, glabrous, scabrous, or appressed-pubescent, 2 lateral veins extending into bristles to 10 mm, awns 15-120 mm long, about 0.4 mm wide at the base, often reddish or purplish, scabrous, flexuous to curved near the base; paleas 6-11 mm, veins often extending into bristles to 2(5) mm, apices acute to truncate; anthers 0.9-2.2 mm. Anthesis from late May to July. 2n = 28. 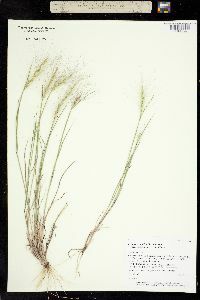 Elymus elymoides grows in dry, often rocky, open woods, thickets, grasslands, and disturbed areas, from sagebrush deserts to alpine tundra. 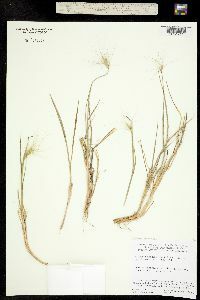 It is widespread in western North America, from British Columbia to northern Mexico and the western Great Plains, and introduced in western Missouri, Illinois, and Kentucky. 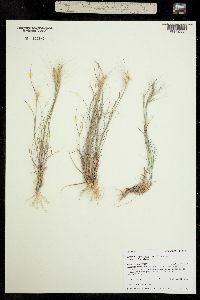 It is often dominant in overgrazed pinyon-juniper woodlands. Although palatable early in the season, the disarticulating, long-awned spikes irritate grazing animals later in the year. 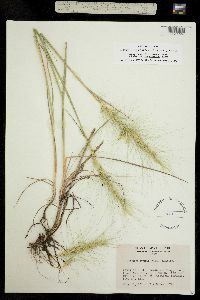 Elymus elymoides intergrades with E. multisetus -in parts of its southern range ( Wilson 1963). 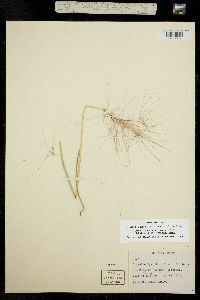 It is sometimes confused with E. scribneri , but differs in having more than one spikelet per node, narrower glumes, and less tardily disarticulating rachises. 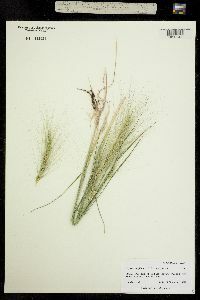 Hybrids with several other species in the Triticeae -are known; they can often be recognized by their tardily disarticulating rachises. 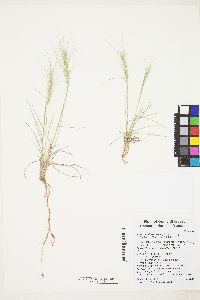 Named interspecific hybrids (and the other parent) are E. -saundersii -(E. trachycaulus ), E. -pinaloensis -(E. arizonicus ), and possibly E. -hansenii -(E. elymoides or E. multisetus -- E. glaucus ). 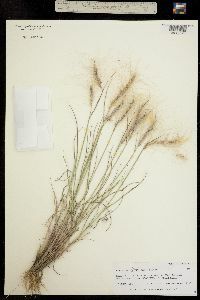 Hybrids with E. sierrae -have not been named; they are common where the two species are sympatric. 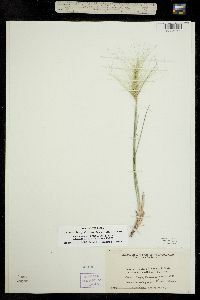 They have broader glume bases, shorter glume awns, and longer anthers than E. elymoides.